they have the same crystal structure as Y123 with some impurities peaks. 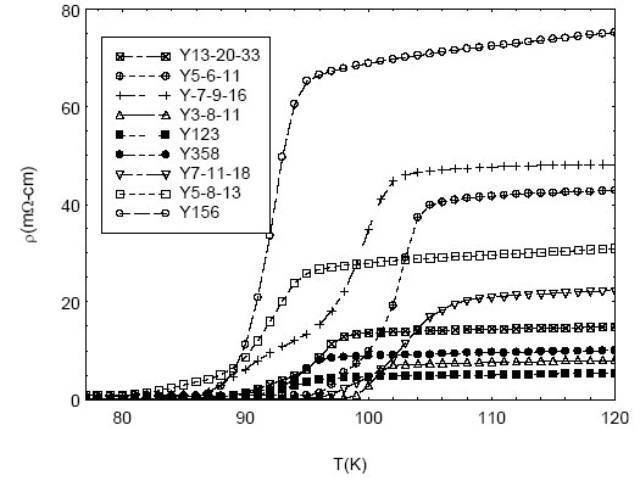 Y124 and Y247 became superconductive at 80 K and 40K, respectively. depending on the oxygen content[5,6]. 102 K. And they also proposed that in order to have a stronger superconductor with higher Tc in the YbaCuO family one should pump more holes from the chains to the oxygen sites of the planes, tending to diagonal charge order. Y123 has two CuO2 planes and one CuO chain. Y124 has one CuO double chain. Y247 has one CuO2 planes and one CuO chain, and one double chain. Y358 has a crystal structure similar to Y123 with five CuO2 planes and three CuO chains. The increasing number of CuO2 planes and CuO chain have important effect on the Tc of Y358. planes in all high-Tc cuprate superconductors to three. We [also] think that there should be a relationship between the superconductors in YBaCuO family. Assumptions about the relationships in these material are made and we synthesized the new superconductors in this family by using our assumptions. We find new YBaCuO superconductors in 7 formulations with a difference in critical temperature in each. 1.the number of CuO2 planes and number of Ba-atoms. 2.the number of CuO chains and the number of Y-atom. 3.the number of Ba-atom plus Y-atom are equal to the number of Cu-atom. get 3 Cu-atoms. In Y358, there are 3 Y-atom and 5 Ba-atoms so we get 8 Cu-atoms. So we think that the main ideal to synthesize a new superconductor in this family is the number of Ba-atom plus Y-atom equal to the number of Cu-atom. number of Y-atom should be missing. This concept are agreed with the assumption to synthesize Y123 that replacing the La-atom by Y-atom in BaCuO2 perovskite; Y 3+ has an ionic radius smaller than La3+ ; and the Tc is higher. We make the assumption that the number of Y-atom should be missing to create more holes to higher the critical temperature. .
1.the number of Ba-atom plus Y-atom are equal to the number of Cu-atom. atom missing and Y358 is 1 Y-atom missing every 5 Ba-atom. Y-atom missing to number of Ba-atom as x100 = 25% . Table 1. Shown the new YBaCuO -superconductors synthesized . read from Figure 2 are shown in Table 2. Table 2. The summation of the Tc of our samples. 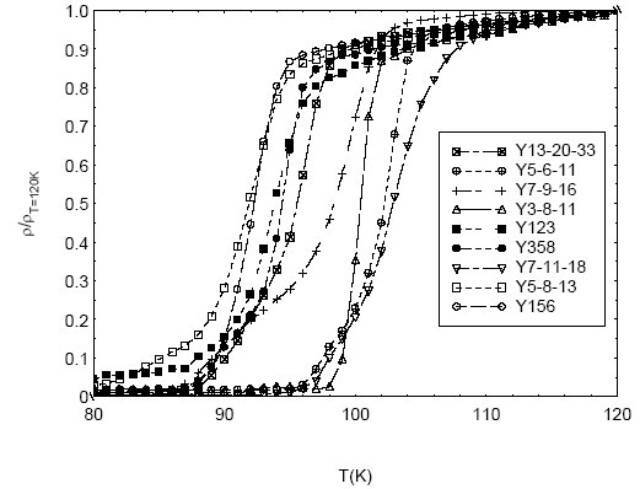 lowest Tconset that 95 K. Y3-8-11 is the highest Tcoff-set , 98 K.
mechanism of superconductivity in this material. Y5-8-13, Y7-11-18, Y156, Y3-8-11, Y13-20-33. The Y 7-11-18 shown highest Tc onset as 109 K. Our samples show the same crystal structure as Y123 with some impurities peaks that occur by the missing of Y-atom in some planes agreed with our assumptions. J.G.Bednorz and K.A.Muller,Z.Phys. B 64(1986) 189. A.Aliabadi,Y.A.Farshchi and M.Akhavan,Physica C 469(2009)2012-2014. Figure 1 The resistivity versus temperature are shown. Figure 2 The normalized resistivity versus temperature are shown.